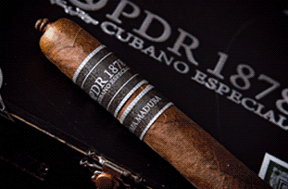 The medium-bodied Pinar Del Rio (PDR) 1878 Cubano Especial Capa Madura cigar was created by Abraham Flores using a dark, triple-fermented Arapiraca Maduro wrapper from Brazil, Criollo 98 binder from the Dominican Republic, and a blended filler of Nicaraguan and Dominican Republic origin - all grown from Cuban seed. The very reasonably priced PDR 1878 Cubano Especial Capa Madura is well constructed and finished with a beautiful pigtail cap. The cigar's flavors are subtle with notes of sweetness, earthiness, and spice, and the smoke it produces at rest and in play is voluminous.